In honor of the country that first trained me in cheese and to their cheesemakers who are hurting from an economic downturn, I will feature one Irish cheese every day during this week to celebrate St. Patrick’s Day. Let me start with a little bit of Irish cheese history. Cheese in Ireland, like in many other colonial lands was brought by missionaries and was deeply linked to religious life. Monks made most cheeses for subsistence markets and remained localize to villages near big monasteries. Much like in England, industrial revolution brought pasteurization and consolidation of cheese making to large dairy companies. It was only in the early 80’s that cheese production returned to farms, and with it the use of raw milk. Most cheeses during that time where made in County Cork and slowly other parts of the country have started to produce excellent cheese as well. There are a high number of cow’s milk cheeses, even if sheep are so familiar in the Irish landscape. In the Americas, the most common Irish cheese is commercial cheddar (think Dubliner), but increasingly in cheese stores you can find Cashel and Crozier Blue, Ardrahan and Coolea. They are all great, but Crozier around this time is just amazing! My favorite Irish cheese is Durrus, however as of late it is very difficult to find a good round outside of Ireland. This raw cow’s milk cheese does not travel well in refrigerated containers and without proper washing. It also cannot wait to be eaten the 60 days required by the FDA to be brought to the US. 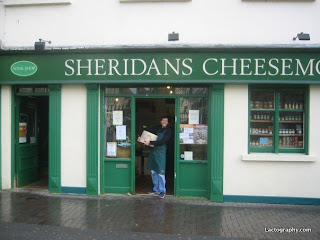 I had one in London that was nutty and stinky and reminded me of cold rainy days working at Sheridan’s Cheesemongers sharing a cup of tea and a bite of creamy Durrus on fresh baked bread.